Florist may use clear glass vase if this exact vase and checked ribbon are not available..
What could be sweeter than a cheerful yellow vase filled with white and yellow daisies? Can't think of anything? Then choose this sunny bouquet. It will brighten their day. Affordable Birthday Flowers - Upsy Daisy in Vase. Florist Notes: Exact vase and ribbon may not be available in all locations. 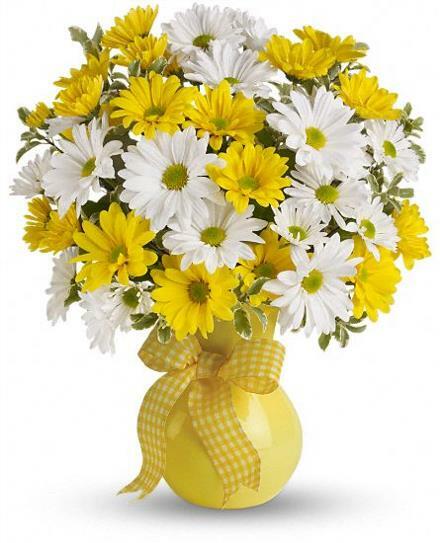 Arrangement Details: The bright bouquet includes white daisies, yellow daisies accented with fresh greenery. Delivered in a bright yellow plastic vase tied with a yellow gingham ribbon.